Hot and Spicy Curried Crab made with curry leaves, dried chillies, halba seeds, mustard seeds, black peppercorns, chilli padi and jintan manis. Heat oil in saucepan. Fry firstly the shallots till golden brown, adding dried chilli, mustard seeds and halba, cinnamon and curry leaves. Meanwhile mix thoroughly the ground spices with coconut milk and salt, pouring this into the saucepan, stirring well. 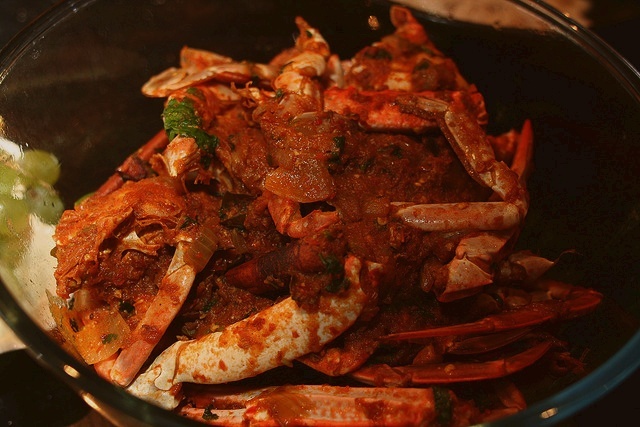 Add the crab and cook quickly over high heat till crab is cooked and dry. Lift from heat and squeeze limes over. thanks for this recipe! very good!